There are three fundamental aspects of Islam: Aqeedah (belief), Fiqh (Law), and Tazkiyyah (Internal Purification). The deeds of the heart fall under the third category. Qalb: Heart – refers to the metaphysical spiritual heart, the center of emotion and beliefs. Adab: Manners – refers to physical good behavior. Akhlaq: Character – refers to internal good qualities that reside in the heart. Tazkiyyah: Purification – also known as Tasawwuf. Refers to the science of polishing the heart. 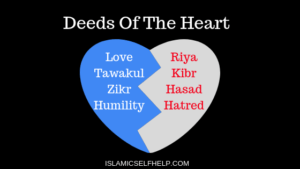 What are deeds of the heart? Most Muslims are aware of physical good deeds. We need to pray, fast, give charity, perform the pilgrimage and learn our religion. These are physical good deeds. We are also aware of physical sins. These include stealing, lying, backbiting, fornication, drinking alcohol and eating pork. However, there are also internal sins and internal good deeds. These are called the deeds of the heart. These are often more important that the external. The Prophet (peace be upon him) said, “The heaviest good deeds on the scale on the Last Day are good character” (Sunan At-Tirmidhi) This shows the crucial importance of internal good deeds. The most important deeds of the heart are listed below. Riyaa – the sin of seeking fame and recognition from people for one’s good deeds. This is also called minor Shirk. It is very dangerous and can turn an external good deed into a sin. Hasad – the sin of being jealous of a gift that Allah has given someone else. Allah distributes the Rizq (sustenance) of His Creation. Our job is to use what Allah has given us to please Him. Wanting what others have is a form of ingratitude to Allah. Kibr – the sin of arrogance. It is prohibited for a Muslim to think he is better than others. In fact, this is one of the major sins. Muslims must continuously make efforts to humble themselves. 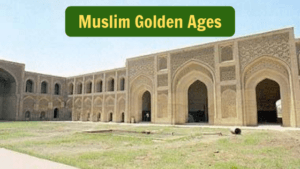 Greed – Muslims must be focused on pleasing their Creator and building their Afterlife. Our worldly pursuits should be fueled by good intentions, not greed. Greed is never satisfied and can consume one’s life. Assuming the worst of others – A Muslim must give others the benefit of the doubt. Assuming the worst of others leads to physical sins like spying, invading privacy, accusations, backbiting and slander. Forgetting Allah – The remembrance of Allah keeps the spiritual heart alive. Forgetting Allah can lead to a dead heart and forsaking the religion. Contentent – The cure for greed and jealousy. To accept one’s destiny and live a happy life with whatever Allah has already blessed you with. A content Muslim still works hard, but does not worry about what is beyond his control. Tawakul – trusting Allah is an internal good deed. The heart must trust its Creator and trust that Allah knows what is best for it. We wrote a separate article on how to do this. Forgiveness – saying you forgive someone is a good deed. But the greater good deed is to truly forgive them with your heart. This purifies the heart and removes malice from it. Humility – The opposite of arrogance. A Muslim heart must be humble. Knowing it is only a sinful servant of Allah, it should never feel like it is someone special or better than others. It should stay grounded and focused on obeying Allah. Remembering Allah. Allah says, “It is only through the remembrance of Allah that hearts find inner peace,” (Surah Ra’d 13:28) This is the key to inner peace. The heart must remember Allah. Zikr can be physical (Salah), verbal (Tasbeeh) or internal (thinking about Allah). All three are equally important for truly remembering Allah and attaining inner peace. This completes our short list of some of the deeds of the heart. May Allah assist us in polishing our hearts and removing the evil from it.